I love Thanksgiving food. I have to thank my husband for introducing me to the tradition; he's been making his family's meal from scratch every year since he was a teenager. Most of the recipes I make now are adaptations of the ones he refined in the past. I enjoy the turkey, the mashed potatoes, the yams, the gravy and the pies, but my favorite is the stuffing (or dressing, depending on how you use it). Of all the Thanksgiving dishes, it's the most complex in flavor and texture. The other dishes are more singular in quality. Yams are sweet. Mashed potatoes are creamy. Sure, they can have some variation and subtlety, but most often, these dishes are really celebration of a single ingredient. Stuffing is the harmony that contrasts the melody created by all the other Thanksgiving sides. It is also the most flexible of all the dishes, and is very forgiving of modification and experimentation. Not to mix metaphors, but croutons form a perfect canvas upon which many contrasting and complementary flavors can be layered. For this particular stuffing recipe I used apples and cranberries, both fall flavors, for sweetness. 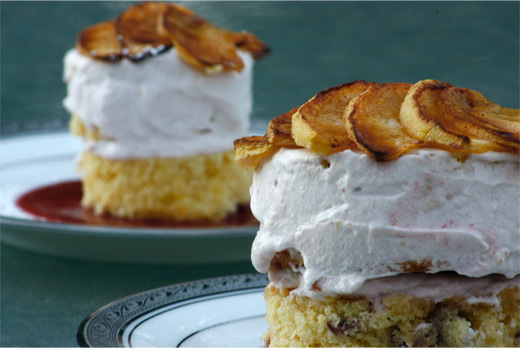 The apples also provide a crunch that's an excellent foil to the softness of the bread. To the usual suspects of celery, carrots and onions, I added shallots and king mushrooms. The mushrooms in particular add an earthy and meaty quality to the dish. All the ingredients were amply seasoned with Italian seasoning and a little lemon zest. Make a cup of Earl Grey tea. Soak the dried cranberries in the cup of hot tea and let them sit for at least 20 minutes, then strain and reserve the cranberries. Discard the liquid. I mixed both a Fuji apple and a Granny Smith for sweet and tart flavors. Peel, core and cube the apples. Drizzle with the lemon juice to prevent (from turning brown) oxidation of the fruit. Finely chop the leaves of a sprig of oregano, marjoram, thyme, rosemary, 2 tablespoons of flat-leaf parsley (with stems; that's where the flavor is the most potent), the garlic chive, the basil leaves and 1 sage leaf. In a mortar and pestle, combine 1/2 clove of garlic, 1/2 teaspoon of salt and the herbs. In a mini-blender (or a mortar and pestle if you don't have one), mix 1 tablespoon of the Italian seasoning with 4 tablespoons of olive oil. Give it a few pulses. Slice the loaf of bread 1-inch thick. (No need to cut off the crusts.) Cut the slices into about 1-inch cubes. Spread the bread cubes on a non-stick baking sheet. Drizzle the herb-flavored oil on the bread cubes. Season with 1/2 teaspoon of salt and 1/4 teaspoon of pepper. Add the garlic powder. Toss well. Bake for 12 minutes. Toss the croutons once half-way through the baking process. All sides should be slightly golden. Remove from the oven. Cool the croutons for at least 15 minutes. In a large pot, heat about 2 tablespoons of oil. Sauté the sage leaves. Transfer to a plate lined with a paper towel. Set aside. In the same pot, add the chopped onions, shallots and red chili flakes. When the color is translucent, season with 1/4 teaspoon of salt and add 1 teaspoon of Italian seasoning. Add the garlic. As the garlic becomes slightly golden, stir-fry the diced carrots. Add about 1/2 cup of broth. Stir well until all the liquid is evaporated. Add mushrooms. Cook for about 2-3 minutes. If the mixture starts sticking to the bottom of the pan, add 2-3 tablespoons of stock . Add the celery and lemon zest. Add 2-3 tablespoons more stock if necessary. Season with 1/2 teaspoon of mushroom seasoning salt. Cook for another minute. Finally add the apples. Add 1 tablespoon of butter. Cook until tender for about 2-3 minutes. Transfer the vegetable mixture to a platter. Set aside. At the last minute, add the croutons to the pot. Add the rest of the butter. Season with the remaining mushroom seasoning salt. Add the remaining vegetable stock. Stir well. The entire mixture should be moist, but not mushy. Add the vegetables and cranberries. Adjust the seasoning. Add more salt (if necessary) and black pepper. Finish with the remaining parsley. Stir well. Serve warm. Garnish with fried sage leaves. Waste not, want not. 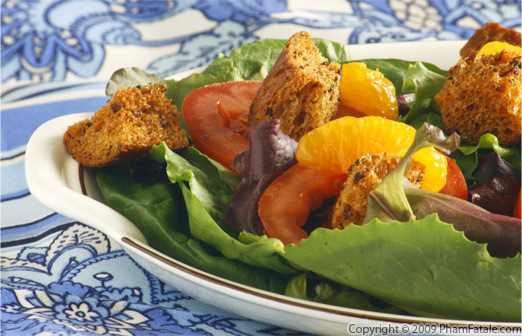 Croutons are a perfect way to recycle stale bread. Check out my other version with brown butter baguette. 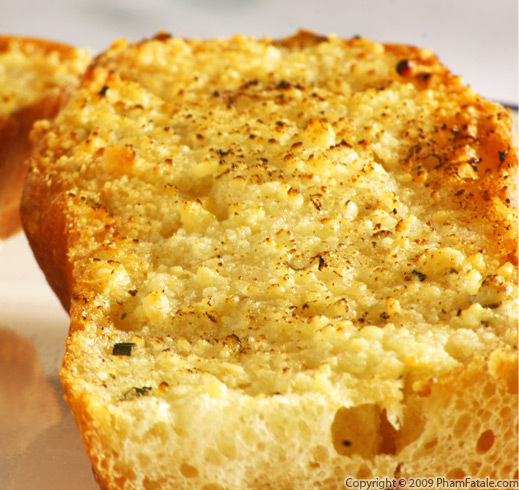 You can also make bread crumbs for mac & cheese or garlic bread for soups and salads. You can find king oyster mushrooms in Asian stores. They are also called abalone mushrooms and have a very meaty texture. I think they are perfect for this stuffing. If you don't have king oyster mushrooms, you can replace with Portobello or any other mushrooms. Mushroom seasoning salt brings a very distinct, earthy flavor to the sauce. You can find it at gourmet specialty stores or in most Korean stores. I get mine at Marina Foods -10122 Bandley Drive -Cupertino, CA 95014. As I do when I make ma-po tofu, I add the vegetables to the pot based on the amount of time it takes each vegetable to cook. The carrots go first, then the mushrooms, etc... 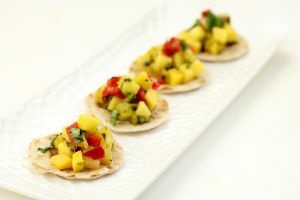 If you want to be extra cautious, you can cook each ingredient separately, transfer to a platter and assemble at the end so that each ingredient is cooked to perfection. I made my own vegetable stock but you can use 2 (14-ounce) cans if you like. Check out more recipes with bread. 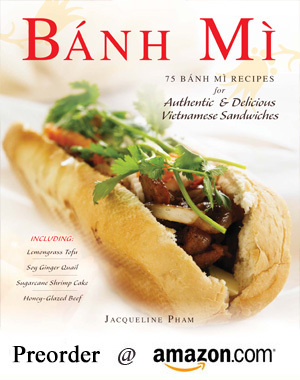 Published By: Jacqueline Pham on November 12, 2009. Gorgeous Jackie, and I love those dishes! Mmmmmm, sounds delicious! Lovely stuffing offering a different flavor profile and combining usually separate fall holiday components. That's an intense stuffing. It has many, many layers of flavors, but it's nice. Some Thanksgiving traditions cannot be pushed aside. I love Thanksgiving food too, and stuffing is my favorite! Your recipe looks delicious! I love your blog, I recommend to all people who love this kind of post to visit this site and blog of great interest to his listeners. 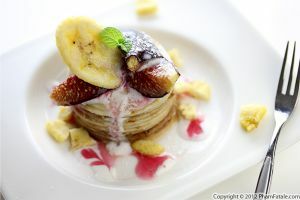 This is a truly gorgeous recipe! Thanks for sharing! Woo hoo! Its my favorite time of year, and I'm going to shovel as much stuffing as I can fit into my maw. You're right stuffing is one of the best things about Thanksgiving and I'm so glad you can partake in the tradition.